Maine Education Commissioner Stephen Bowen and Gov. Paul LePage discuss their new ABC Plan for education reform on Wednesday, July 25, 2012 in the State House in Augusta. AUGUSTA, Maine — Gov. Paul LePage touted a recent Harvard University study Wednesday that he says proves Maine’s education system is “failing,” “dismal” and “stagnant,” and that Maine students are looked down upon when they go to other states for school or work. At a press conference at the State House, LePage and Education Commissioner Stephen Bowen provided a general outline of a new education reform initiative — which they called the “ABC Plan” — with the promise that more detailed proposals are coming in the weeks and months ahead and will be ready for the next legislative session. Among the proposals LePage says he intends to champion are holding low-performing schools accountable for their failures, perhaps by having state government take schools over in the most extreme cases where other interventions fail, and requiring any high school whose students require remedial coursework in college to pay for those courses. He also vowed to bring back a school choice bill that failed in the last legislative session. The Harvard study referenced by LePage, which was released last week by the school’s Program on Education Policy and Governance & Education Next, found that among 41 states participating in the study, Maine ranked 40th in terms of its rate of improvement on standardized tests between 1992 and 2011. While Maine’s improvement rate was low, the state’s students still score at or above average on the National Assessment of Education Progress in many areas, though Maine ’s former top rankings have eroded in the past two decades. In 1994, Maine’s rate of fourth-grade reading proficiency — considered by many to be a key indicator of long-term academic success or failure — stood at 41 percent. In 2011, after years of flat scores from Maine and improvements in other states, Maine had lost its lead and ranked even with the national average at 32 percent. LePage also cited Department of Education data that indicates 54 percent of students entering the Maine Community College System, and more than 20 percent of students entering the university system require remedial coursework. “We can all sit back and stick our heads in the sand and pretend we don’t have a problem, or we can get together to work on it,” said LePage, who specifically targeted organizations such as the Maine School Management Association and the Maine Education Association for opposing some of his initiatives. In the last session, those groups opposed a charter school bill, which passed, and a school choice bill, which didn’t. LePage and Bowen’s ABC Plan stands for accountability, meaning developing a way to assess school performance and providing assistance to those that are struggling; best practices, which means studying successes in other states and countries and emulating those methods here; and choice, which means giving Maine students the option of going to whichever school they wish. 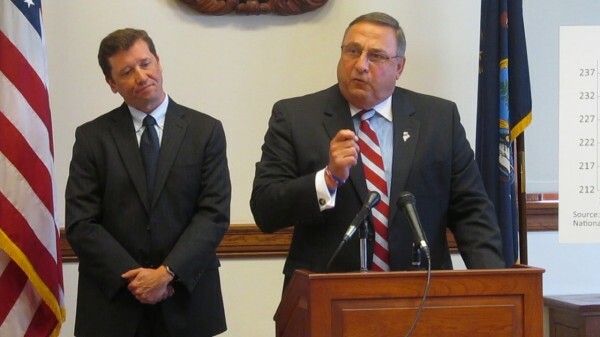 A bill proposing the latter initiative failed last year, but LePage and Bowen said they would revive it. The Harvard study discussed by LePage has been the source of conflict between him and education leaders in recent days. Dale Douglass, executive director of the Maine School Management Association, wrote in a July 19 bulletin to the association’s members that LePage “misses the real story on student achievement in Maine.” He argued that Maine’s NAEP scores remain in the top tier nationally and that the state’s poor ranking in the Harvard study is because it becomes harder and harder to improve scores when the scores are already high compared to other states. In a letter to LePage, Douglass said he is convinced that the governor’s criticisms of the Maine Education Association, the Maine Principals’ Association and the Maine School Management Association stems from those organizations’ opposition to LePage’s charter school and school choice initiatives. In a response from LePage dated July 23, the governor dismissed Douglass’ arguments.